Almost a decade ago, the female duo named "Puffy" got a big break in the Japanese pop music world. Slovenly dressed with T-shirts and jean pants, their singing style is lackdaisical. Because of their group name, when I see them on TV they always remind me of a patient I had at my clinic. It was 5-year old boy with severe palpebral lid and the mother told me that the previous doctor prescribed him an anti-allergic eye solution. Of course a skin allergic reaction causes edema but it should be accompanied with inflammatory change. In case of systemic edema caused by acute nephritis or cardiac failure, there is no sign of inflammation, however edema is more noticeable in orbital area because palpebral tissue contains gaps to enable rapid lid movement.Together with other physical findings, I diagnosed this boy with acute nephritis and transferred him to the chilren's hospital immediately. Later I received a letter from the pediatrician saying the boy was seriously ill from nephritis and admitted to the hospital. One and a half years later, the boy showed up again with the mother and I was very happy to know that they dropped in just to say thanks to me this time. When you have a headache and consult a book about it, your headache may worsen before you finish reading it. Because headaches may ensue from so many diseases, it is difficult to determine the source. Possible source of your headache could be a common cold if your symptoms are combined with a fever,cough and stuffy nose. In case of habitual headache, the more you worry, the worse your headache becomes. Because the recurrence of a headache makes you suspicious whether there is a serious disease hiding behind it. To wipe out your worry,I recommend a brain MRI examination. 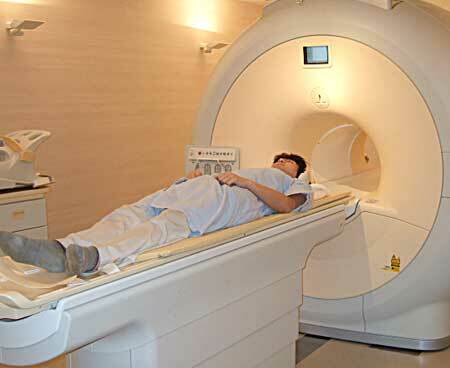 In this country MRI equipped medical facilities are located within your reach, even in your own town. With a doctor's instruction MRI tests cost you around ￥7,000 if you are enrolled in Japanese Healthcare System. When thorough MRI examination reveals no space occupying lesion or vascular abnormalities in your brain, your worries will vanish immediately because the result indicates no life threatening disease. Besides MRI examinations, there is still much to do for the search of your headache but hopefully minor diseases such as the common cold could be the source of your headache. Application of multiple times a day of eye solution would be a cumbersome work for the patiensts. The new drug delivery system proved a great boon to the patients enabling once a day use of eye solution. But the new technology does not always bring the benefit. In order to retain eye solution longer in the eye and prevent it from being washed out, its vehicle has a viscous nature. After the dose of once a day use-eye solution, you may have blurred vision, which wolud be hazardous for driving. This symptom would be more pronounced if you have dry eye. You should stop driving for a while until your vision recovers. Please take heed of this dangerous aspect of once a day use-eye solution when you drive.